In the front of City Hall in Old Montreal, Quebec in Canada, the stunning Champ-de-Mars park is luxuriated in beautiful green grass. This park is open to the public where people relax and enjoy the surrounding buildings like City Hall. In previous years, Champ-de-Mars was a military parade ground. 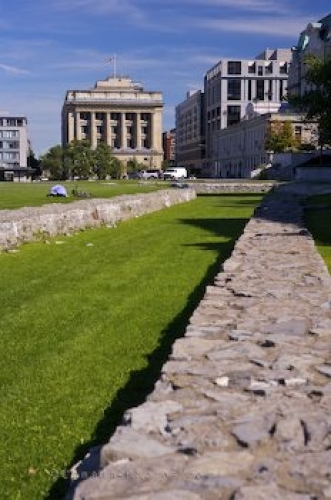 The cement slabs in the park represent the foundations of the military parade ground which was demolished in the 19th century before City Hall and the Palais de Justice were built. This is when it was redone to make the area the park it is today. There is a metro station named Champ-de-Mars which was named after the park and is beautifully designed in stained glass on three sides and the interior is done in soothing blue and cream tiles. Picture of the Champ-de-Mars park in Old Montreal in Quebec, Canada. ... , Montreal city, Quebec, Canada.